Staff Sergeant Rebecca Thomas has always been a girl confident in her own skin. That is probably why she has no problem paving her way in a career primarily made up of the opposite gender. Women have only been allowed to serve directly in the US Air Force since 1948, when President Truman signed The Women's Armed Services Integration ACT. Still there was a limit of 4,000 women permitted in the US Armed Forces, and only 300 female officer positions. Around 1976, things began to move more forward and women were being accepted on much the same basis as men. SSgt. Thomas began serving in the United States Air Force in 2005. I met this remarkable young woman in my high school years when she and her family moved to my home town. She is the daughter of Southern Baptist Pastor Larry Thomas and his wife Anita. SSgt. Thomas grew up with siblings Jessica and Jeremy. I don't know that I have ever met a family as closely knit as this one. They have something special when it comes to family ties. I am positive the family's heart is overwhelmed with pride at all the things that SSgt Thomas has achieved so far in her life, and I am sure they will continue that cheering as she accomplishes so much more. 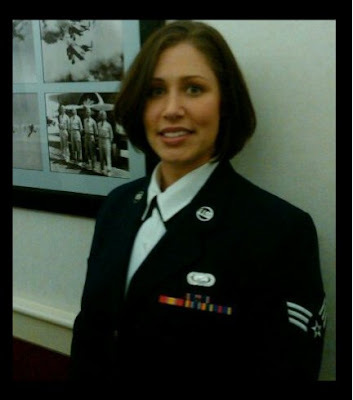 When I asked SSgt Rebecca Thomas why she joined the Air Force, she told me she was searching for a change in her life. She turned to the United States Air Force to began making those changes. While Rebecca is a woman with some big dreams, lofty itineraries and little fear for chasing after them, she holds an open mind to bigger and better things. Dreams can kind of change things, so remaining flexible is important to her.She graduated Career College of the Air Force in 2009 in Information Management and American Military University in 2010 with a sociology degree. SSgt Rebecca Thomas is currently deployed overseas where she serves her country as a Client Systems Technician. In other words, computers are her thing. I would describe SSgt. Thomas as a woman following her own heart guided by confidence, spirit, loyalty, and a desire for adventure. She is a strong, independent female with a vast generosity and soft spot for the human race. She is now one of the over 200,000 women that make up around 14% of soldiers actively serving this great country in the US Armed Forces. Question: What made you join the armed forces? Answer: This is a tough question because it would take more than a few sentences to really explain, but to make a long story short, I wanted a change in my life, a steady job, experience, and to be able to finish school without the insane cost. Probably the most important of those things was the change in life. I didn’t like where I was at in life, didn’t have a whole lot of money to take me to other places in life, so the military was a great way to do just that. And a change it has been! Question: Do you have any good memories from your service overseas? Answer: I don’t think I have any just “horribly bad” experiences from my time overseas, but “good” memories are few and far between. The people in Iraq and Afghanistan are extremely poor, have little to no medical care, poor housing, bad water...etc. It’s an extremely sad environment. Not to mention the vast hostility in the country. Not only are the military members not safe, their own people are in the midst of war devastation every day. Living on a base in Afghanistan is different than going outside the gate into the city, though. It’s not the comforts of home, but at least we are fed regularly, have a gym, and are provided different activities that we can take part in to be able to enjoy ourselves a little bit... It’s mostly hard work, but it’s worth it. Question: What is it like being a female solider? Answer: When I first came into the service, I imagined it would be strange to be a female in the military. I’ve found, however, that it was merely my lack of knowledge that made it strange. I met more and more females, formed bonds, and learned how to cope with being a female in a primarily male field of service. It’s really not that bad in the Air Force, though. The Air Force seems to treat females with more respect and dignity than other services (probably why there are so many more females in this particular branch). We are “expected” to be able to do the same things as men and we are “expected” to be treated like them. It’s nice. Question: How do you think people overseas view us Americans in your experience? Answer: Where I am, they are more accepting than other places. We help with their economy a great deal. Everywhere you go, they are trying to sell something... Most are small businesses where the owner does the selling. And they are GOOD at making sales! lol We also provide jobs for many of them. Every base you go to will have a vast number of Afghani workers working hard to make money to feed their family. We are also providing professional training to the Afghani National Army, which is in great need. Most of them are greatly appreciative. However, it is still a war zone... and as much as we would like to change it (and it’s certainly not everyone), the main reason we are here is “because” they hate us. They don’t want us here for many different reasons. The Taliban is the most popular terrorist group in this area and they hate us. They threaten other local people for either helping or trying to help, which causes many locals to hate us, the constant gun fire and bombs that go off due to terrorist activity are blamed on us, which causes others to hate us. It’s a sticky situation. We need to be here, many want us here, but the ones that don’t make it known in a hard way. Question: I am sure your family is very proud of you, and I know you guys are all very close. How do you cope with being away from them? Question: What frustrates you the most about the American people in generally speaking? Answer: It’s difficult to put “all” American people into 1 single category of frustration. I love my country and all of its people. However, there are some definite frustrations in relation to being in the military. I am frustrated when people tell me that we are in this war for no good reason and my being deployed is a waste. I understand people don’t “like” us being here, but we are here for a specific, honorable purpose and most of us WANT to be part of it. It’s frustrating when people do not recognize that and believe only what the news tells them. I guess you could say that I am frustrated by people’s ignorance. But again, I can’t say that all American people are generally frustrating in any particular area. Question: What luxary do you miss most about home? Answer: I’d say the better question is what luxury DON’T I miss about being home! A bed that isn’t twin sized with a mattress you can see the springs through, privacy in my own home and bathroom, a bathtub I don’t have to stand up in if I don’t want to, cooking my own food or going to restaurants, not having to walk everywhere I go, internet and phone service that actually works the majority of the time, seeing the people I love in real life rather than through a computer screen, wearing my own clothes... lol it’s the little things. On a personal note I would like to publicly thank SSgt. 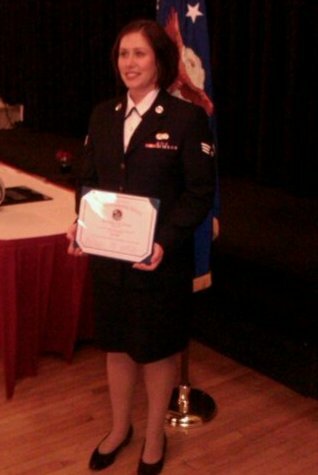 Rebecca Thomas for choosing to serve this beautiful country I call home. America is lucky to have you. You have so much to offer the world, and I applaud you for bringing all your talents to the table to serve in this time of war. You are truly a stunning human being, my friend, inside and out. Thank you again for allowing me to feature you on Inside My Head. I appreciate the time you sacrificed! Jaime, this is a very good blog/interview! Thank you so much for highlighting a daughter that I am so proud of! I meant to use my name in relation to the above comment. I am Larry Thomas, the father of Rebecca! I am very proud of her! This is Amazing!! Thank you, Rebecca! I am proud to call you and your family my great friends!! Love you all, Stacey Flowers!! Wow, really cool interview. Such courage! I am Rebecca's Aunt Teresa. I am so very proud of this young lady. She's following her dream, if only, we were all as brave as her. I Love You, Rebecca. Hurry Home. Aunt Patricia here: I have always been proud of Rebecca because she is so smart and so beautiful. I am especially proud of what she is doing over there. I miss you very much, Becca, and I can't wait to see you again. Stay safe and hurry home! I am Rebecca's Aunt Barbara. I am very proud of this young lady and what she is doing with her life. She is a very special young lady. Love you Becca. Come home soon, we miss you. I am so proud of my Little grand-daughter, Rebecca!! She's alway's at my house on holiday's. I missed you so much this past Easter. It didn't seem right. I Love you so much. Stay safe. and Hurry Home Soon !! I was already proud of Becca, but after reading this interview I am even more proud. First I have to say. WOW. My sister is so completely mind boggling sometimes I feel like I have been to an 80s concert and thrashed my head all night. Secondly however Jaime this is WAY AWESOME!!!!!!! The Love of a Granny Sadie!